Renting a roll off dumpster is a great idea if you are planning a renovation, large clean out, or a construction project. For most people, the need to rent a dumpster is few and far between. If you fit into this category we are here to help. There are a variety of container sizes and each one helps with different projects. The size of a container is based on the amount of volume that each is able to hold. For example a 30 yard dumpster is named that way because it holds up to 30 cubic yards of debris. The most common sizes include. Each bin is equipped with a large gate at the rear. To gain easy access to the container simply lift the lever and swing the gate around. When planning to get rid of large, bulky items we suggest walking these in prior to closing the gate. This will allow for the greatest utilization of the container. Once larger items are placed at the bottom of the box simply shut the door and continue disposing of your junk over the side wall. The price of a roll off container range based on sizing, weight, and amount of time onsite. When you rent a container from Discount Dumpster you are getting a flat rate, which includes the aforementioned. Be sure to know the weight limit of your bin as to not go overweight. If your container ends up weighing more than the given limit an overage will apply on a prorated basis. Each dumpster size allows a specific amount of weight. When you call a trash company you will be quoted on a per ton basis. One ton is the equivalent of 2,000 pounds. The larger dumpster you rent the more weight allowance you will receive. Though it is rare it is possible to overfill your rental with too much weight. If this occurs a fee on a prorated, per ton, basis will occur. We want to make sure your project runs smooth from start to finish. To do this we allow a specific amount of time with every rental. However do not worry if you feel time is running out. 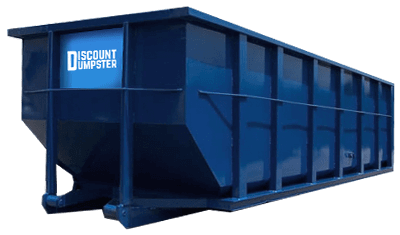 Discount Dumpster will extend your rental period for a flat per day price. Due to not having the ability to give an estimated time of arrival we do not include your delivery day toward the rental duration. We pride ourselves on providing great customer service. We do this by making sure every customer has their bin on time. Though we may be able to deliver a container on the day of or next day or request, this is not always the case. The more time you provide us with, the better chance we can schedule a time of delivery. Greatest thing about receiving a dumpster rental is that you don’t have to be onsite during delivery or pickup. We give detailed instructions to all of our drivers. That means you can go on with your day knowing your container will be onsite by the end of the day. When you make a rental and give our team instructions be sure to keep in mind where the bin will be placed. On day of delivery and pickup there should not be anything blocking it. No reason to be charged an unwanted trip fee!